Document management software is a solution that handles documents creation, sharing, organization and archiving. The solution streamlines these processes to improve the productivity of your business’ way of managing files digitally. Its central electronic location makes documents and information easy to find which saves your time so you can manage more of your company’s core operations. Businesses are realizing that transferring some of their vital operations into a digital, automated system is a practical solution. One of these includes how they manage their documents. Paper-based files must be printed out and filed manually which is both time-consuming and costly. Retrieving them is also arduous. At the same time, digital files are difficult to manage, share, and archive without a central system. Engaging a document management software mitigates this problem. It’s even considered as a major development in the corporate world. What are features of document management software? What are types of document management software? What are key buying factors for document management software? What is pricing of document management software? Why you should automate document management? Today’s fast-paced digital environment will get your business left out from your competitors if you don’t adapt to technical innovations. 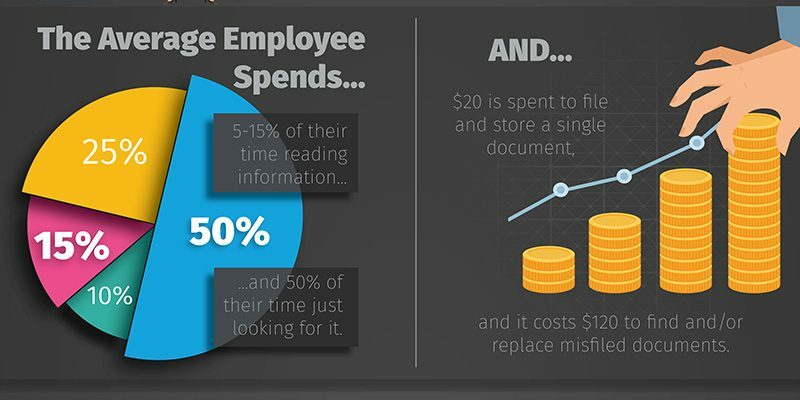 According to Business.com, 21.3% of productivity is lost due to document challenges. Little things, such as finding it hard to locate or open a document, can lead to a big loss in productivity as it adds up in the long run. Poor document storage takes an average of 18 minutes for retrieval which equates to losing 50% of time lost in just searching for a document. It has come to a point where implementing a DMS is no longer just a luxury, but an essential necessity for streamlining document-related business operations. Another area that takes up a relevant amount of time is creating versions of a document. Up to 83% of the time is lost by knowledge workers in tracking these versions and ensuring everyone receives the latest document version. This is significant especially since 92% of knowledge workers collaborate over documents via email. What can be done? Organizations that are utilizing the software reveals digitizing these operations improve their productivity and efficiency. E-signature reduces the turnaround time of a document by up to 80% as per Ademero. Digital workflows transfer, store, and route files smoothly and securely. Moreover, you can save around $20 from filing and storing a single document and up to $120 for searching and/or replacing misfiled documents. Centralizing document management. What is document management software if it doesn’t streamline the way you manage all your documents. Gone is the time when you have to keep a stack of documents in your office, file them in different storage cabinets, and make sure they’re clearly labeled until you’ll have to retrieve them. This method is messy and hard to keep up. Having a DMS organizes your file easily using tags and labels. When looking for a specific file, you can easily search for it and filter the results. This cuts down the entire process from a couple of minutes (and sometimes, even hours) to a few seconds. Improving collaboration. Collaborating between teams is one of the core functions of a DMS. Being able to view and edit a document at the same time with your teammates cuts down forwarding time and gives a real-time update to everyone. Multiple versions of a document show each member the recent version and all changes made to align everyone with the most up-to-date file that’s ready to be shared anytime. It also automates the process of keeping some documents updated, usually at a defined period of time, as required. Setting deadlines and getting reminder alerts saves time and improves annual auditing processes. Increasing data security. Documents must be protected at all times. Many software programs do so by implementing a role-based access control which only allows entry of specific users to the document. The manager can grant them access and approve the actions they can do, such as viewing, editing, and sharing the document. Furthermore, you’ll know who viewed the document and who made all modifications in the file’s history. Documents are also protected from disasters, fires, and floods because they are safely stored in the system. Expediting file retrieval. Around 7.5% of documents get lost while 3% of them are caused by poor filing. Professionals use 5-15% of their time reading information to grasp its content and spend up to 50% of the time to look for documents. Hence, streamlining the process helps in speeding up archiving and finding these files. Simply use a keyword or keyphrase to look for a specific file instead of scouring the a big pile of paper stacked in a file cabinet. It also allows using the software remotely even when you’re virtually anywhere in the world, so if you have to immediately retrieve a file, you can do so without a sweat. Bolstering regulatory compliance. The 21 CFR Part 11 and Annex 11 requires records to be retrievable, secure, and ALCOA (attributable, legible, contemporaneous, original, and accurate) which is reinforced by technical controls. Doing this manually is challenging. However, the document management software makes it hassle-free using audit trails, security, and backups to ensure compliance. Reducing carbon footprint. Going paperless is a greener option. The operation minimizes the waste of paper, ink, and multiple machines to print, scan, and fax your documents as this will be taken care of by a single system. Being environmentally responsible is becoming one of the vital focal points of many organizations and consumers lately. Hence, you can take part in raising awareness for reducing pollution and document wastes in your workspace. Proofhub’s user interface across various devices. What are the features of document management software? Document storage. Archive your files in a single vault for easy retrieval, storage, and sharing for future use. Centralizing this process ensures relevant information is immediately accessible when needed. Security and access control. Avoid unauthorized access by implementing role-based permissions for file entry. Some software programs also restrict IP addresses. This ensures only the right people can open, view, and modify certain files. Version control. Stay in control of your document’s versions without having to maintain multiple copies of a single document. It lets you see all the versions made and alerts every member of the most up-to-date version. Indexing and classification. Index files systematically for a quick, easy retrieval later on given its file key. Bulk upload. In most cases, documents come in bulk. Uploading them one by one is time-consuming. With the software, you can upload everything in one go more efficiently. PDF document editor. Applying adjustments and modifications to a PDF file is made simpler. Add text, textbox, date, and check bar for customizations. You can also make notes and eliminate typo errors with an online spell checker. White-labelling. Define your company’s branding by setting up its color, theme, and logo to ensure it conveys your brand’s look and feel effectively. Doing so makes your company appear more professional. Mobile apps. Access your files even when you are using a tablet or mobile device. This also simplifies image capture of documents and quick uploads. File synchronization. Sync online files with the copies of documents stored in your system. This is essential in updating your team with the latest documents. Audit trail. Referring to a document’s path in its lifecycle, this feature lets users pull detailed reports on the path that the file has followed. This contains the name of the user, date and time the file was accessed, the type of action performed, and keeps comments from the user. What are the types of document management software? Cloud-based. The software is hosted by your provider and it is accessible online. Logging in the system is possible using any device as long as you’re connected to the internet. The payment for the service, which is usually based on the amount of storage, number of users, and included features, is charged on a monthly fee and billed manually in most cases. The provider also takes care of software maintenance and upgrades at no additional costs. Some factors to consider before choosing a cloud-based software is your dependence on your internet connection and provider when it comes to the data center. Meanwhile, its benefit is not requiring an IT team for installation and keeping it running properly. Tapping into the system can also be done anywhere and anytime while files are automatically saved in the cloud which mitigates the need for regular backups. Self-hosted. In this setup, the document management system is stored on your own company’s servers. You may store as many files as your server allows. Its pricing plan generally comes at a one-time cost (which may base on your organization’s number of users.) Most self-hosted systems have a price range of at least several thousand dollars. Some systems charge the installation fee and initial software fee. There may also be additional license fees for every user. For ongoing support and upgrades, you may be charged with optional yearly payments. Its challenges come on regularly backing up files manually. Not all of these systems are compatible with Mac and Windows computer so you must double-check and ask if the service you’re eyeing is compatible with your devices. Meanwhile, it’s suitable for users who value being in control with their own system without relying on others to keep it running. No type is better than the other. The key to choosing which one suits your business is understanding your requirements first and knowing which are your priorities and available resources. What are the buying factors for document management software? Time and cost efficiency. In business, saving time means saving money. Achieve this by boosting employee productivity with the help of an effective system that cuts down time in delivering file-related tasks. Central file repository. Look for a system that provides a central archive for all your files so you can quickly and easily access, view, change, and share your documents with your colleagues and clients. Accessibility. When collaborating projects with your team members, being able to access your files anywhere and anytime is vital. Check if the system is compatible with any device, including tablets and smartphones, so you and your team can open the document remotely or on the go. Secure content. Ensure only authorized users are allowed to open, view, and make changes to a file with RBAC (role-based access control). This prevents potential risks of letting sensitive and vital information fall into the wrong hands. Third-party software integrations. A system that has a nifty capability to integrate with third-party apps is valuable. If it is pragmatic to your system, choose a DMS that offers robust integrations. Systematic organization. One of the vital factors you must look for in a system is the efficiency of its system to let you smoothly organize, locate, and retrieve documents for future use. They may be filed using tags, categories, subcategories, and metadata. Document sharing. Regardless of your team member’s location, quickly sharing files with them is crucial. Users get to provide links, password-protected files, and web-published documents while getting to monitor who’s opened, viewed and edited the document. PDFfiller. This online tool lets you edit, sign, and share your files easily through its drag-and-drop feature. It supports PDF, Word, Text, and PowerPoint file formats. Files may also be imported from your computer, Dropbox, Google Drive, Box, and Cloud Storage accounts. The system is packed with tools as your filing cabinet, scanner, and fax machine. Making changes to a PDF file—such as formatting the document, adding information, and adjusting content—is done through its PDF Document Editor. It automates form filling, creates new forms and documents, converts PDF files, hosts fillable forms, supports mobile apps (both iOS and Android), and incorporates API, among others. Its document storage is secured with two-factor authentication, signature verification, audit trail, and encrypted folders. PandaDoc. A web-based document management solution that allows users to create, deliver, and share documents online and place their legally binding signatures for faster paperless transactions and processes. The system supports various document forms including PDFs, Docs, and other preexisting digital documents. It works well with quotes, contracts, agreements, and other sales collateral. Proofhub. 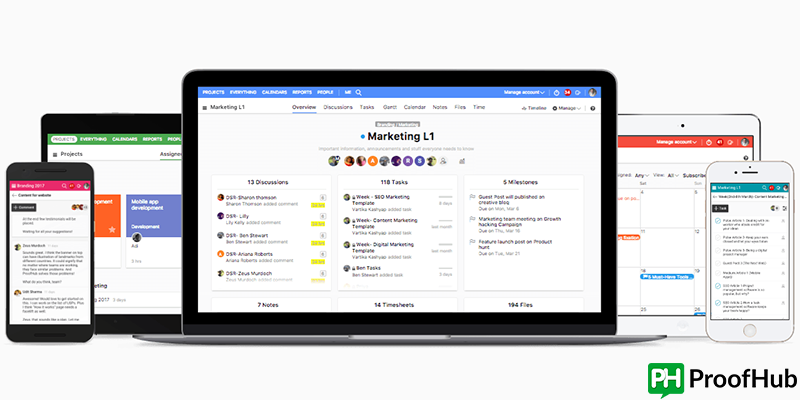 As an online project management software, it anticipates the collaboration and sharing needs between teams and clients through organizing and centralizing files and documents. It utilizes folders to ensure easy and quick file retrieval. To avoid having numerous copies of a single file, Proofhub creates multiple versions for easy grouping and tracking on the latest copy. It also has a built-in “Proofing” for expediting the file and document reviewing process. This uploads files, shares feedback, sendsw invitations to clients and adds collaborators. Additionally, it comes equipped with various work management tools to eliminate the need to have different services in managing and delivering a project. Some examples include task management, integrations, and project templates. eFileCabinet. This straightforward and robust DMS is available in the cloud and on-premise deployment options to cater your business’ needs for file management. Both of them offer an intuitive user interface that eliminates learning curve so users can immediately commence working. eFileCabinet desktop gives automatic file backups, allows e-signature integration, utilizes CSV export, and includes web portal capabilities. It also scans, manages, and shares client information easily. Meanwhile, the eFileCabinet cloud solution maximizes Salesforce integration, compliance tools, and role-based permissions. It has free mobile applications for smartphone and tablet users. Its Mac OS compatibility lets Apple users print and scan files easily with no additional plug-ins. Those who are freelancers and independent consultants get a specialized subscription option with eFileCabinet Express so the user won’t pay for additional features, integrations, and costs that aren’t needed by an independent user. Samepage. Aimed towards improved productivity, Samepage is a collaboration software packed with crucial features for managing documents efficiently. Its file management tool organizes all your files in one place so they are easy to retrieve. The cloud file integration centralizes your documents without migration. You can add files using Dropbox, Egnyte, Box, OneDrive, and Google Drive. File sharing lets users upload and store documents in the system where your team can access it anytime. It syncs online files with copies on your hard drive to ensure it’s updated. This is essential for offline access and updating the team’s locally stored files. Using the desktop app, direct file editing allows adjusting and saving files directly. You can also keep track of any changes made and who made them as it shows the file revision history. Templafy. This is a dynamic template system for organizations that produce thousands of documents, emails, and presentations in a day. It integrates vital office suites and solutions used by businesses on a daily basis for efficiency and productivity. One of its core elements is its on-brand and productive document culture. This allows document automation to eliminate the time-consuming process of creating complex documents. It follows a strict level of quality assurance and governance for these complex files while ensuring the content is up-to-date. It has asset libraries, base templates, intuitive web interface, content management, and integrations. Since it is cloud-based, users can access their files for global organizations using any device, including smartphones and tablets. Synergize. A robust document management software designed for the trucking sector, enabling businesses in this particular field to manage, organize, and access their critical documents with ease and efficiency. With Synergize, users are able to capture, store, and distribute documents and data without worrying about data security or putting in manual work. eSoftTools OST to PST Converter. A conversion platform that quickly and effortlessly transforms your OST files to PST format. It can convert all sorts of OST files, including emails, contacts, notes, tasks, journals, calendars, and more. Aside from OST to PST conversion, eSoftTools OST to PST Converter can also perform recover and export deleted OST folders and files with all the data intact and complete. Kernel for OST to PST Converter. An email migration tool designed to convert OST files and mailboxes into PST format. The software is capable of retrieving user mailboxes from OST files that are orphaned as well as damaged OST files and convert them to PST format (on any Outlook edition). MetaDocs. A complete document management add-on that enables users to scan and send documents directly into Dynamics NAV. The software has a drag-and-drop function that lets users organize their files inside NAV or from multiple locations into the target software. Intranet Connections. A suite of intranet solutions that are designed specifically for businesses and organizations in the financial, healthcare, and general industries. These intranet products are built to help users simplify and accelerate communications within their organization, improve collaboration, enhance efficiency and control, automate tasks and processes, and create and implement better learning and retention strategies among other things. DocPro DMS. Designed to provide users with total control over all their documents and files, DocPro comes equipped with a plethora of functionalities that make document management a walk in the park. This cloud-based platform features document scanning, version control, workflow automation, meta-data management, audit logs, full-text indexing, and permission lists, among others. Most importantly, it centralizes all your data in an easily accessible platform. Finding specific documents is a breeze thanks to its powerful search functionality, which displays all related files based on the file name or keyword relevance. PDFfiller dashboard for uploading files. PDF Filler. Offered in three pricing packages, users can start from a basic Personal plan. It costs $6 per month that’s billed annually at $72 for one user. Businesses that need advanced features and have more users may prefer the Professional and Business plans. They offer 24-hour support and a 180-day money back guarantee to ensure customer satisfaction. Proofhub. Implementing simple pricing plans, it’s available in two packages which starts at $45 per month billed annually that’s already packed with core features and unlimited users. The higher plan comes with additional offerings such as unlimited projects, a higher storage capacity, and advanced features. eFileCabinet. It has a wide range of pricing options available for specific DMS requirements. Freelance and independent users can opt for Express which costs $9.95 per month billed annually. Its features specifically target these types of users. Meanwhile, businesses may choose between the multiple plans that are subscription basis for the on-premise and cloud-based deployments. Prices are available on request only. Samepage. What sets Samepage apart from other systems is it offers a fully free plan that’s packed with the basic, essential document management features. Businesses that need more advanced features (unlimited teams, sub-teams, and pages, for example) and higher storage capacity (1TB compared to the Free plan’s 1GB) may upgrade to a Pro plan. Templafy. Pricing is only available upon request for a quote. It will be based on the number of users, features, and add-ins you’ll employ to ensure you only pay for what you will actually use. They’ll have to ask for your business’ arrangements and requirements to identify your productivity and compliance needs. What are the potential document management softwar issues? Steep learning curve. As with any new technology, there comes a certain rate on a user’s progress of learning how to use the software. Transferring from a manual process to a digital one may take some time to get used to, but most document management systems have a user-friendly interface and system support available. High costs. Purchasing a service comes at a cost. Additionally, there may be additional fees for certain features you need. However, being aware of the system you’re implementing can mitigate this issue. Most of them offer a free trial so you can test if it suits your business needs or not. Others also have a money back guarantee if you find the system doesn’t work with your organization. You may also customize your plan to ensure you’re only paying for the features you’ll actually use. Reluctant employees. There will be some employees who are reluctant to radically change their ways, especially processes that they’re already used to. Engaging a new software may not be accepted well in your team at first. If this happens, you may initiate an open communication with them to let them understand the benefits and convenience the system can provide. Discuss how it will boost their efficiency and productivity and save their time in completing tasks. Providing them support and assistance to learn how to use the system is also essential if they’re not tech savvy. What are the latest document management software trends? Mobility. People nowadays are always on the go. A device that keeps them connected is their tablets and smartphones. Many document management solutions have adapted to this arrangement by being available on many devices as apps so they can access their files wherever they are in the world. Cloud accessibility. Most systems are now available as a web-based software because numerous business operations happen (and can be accomplished) online. By just having an internet access, which is widely available, you can access your file while not being limited to a single computer. Online solutions also offer enhanced security and ease of use. Client portals. As an integral part of your business, it’s essential to provide a portal for your clients. Giving them access to necessary documents and a space to react and provide feedback on your product and service gives value to your business. This feature generally lets clients log in, access files, send inquiries, comment on documents, and download their files.